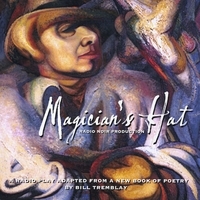 From the opening sounds of a cocktail party going on in George Gershwin’s Park Avenue Apartment on Halloween, 1936, and the first struck chords of music, this radio play makes the life and art of José David Alfaro Siqueiros, the great Mexican Muralist painter, come alive in vivid sound that creates a doorway into another world where Siqueiros meets and falls for Angelica Arenal, a war correspondent on her way to cover the Spanish Civil War. David impulsively decides to join her in Spain and their love affair blossoms amid the artillery barrages of war and the drone of German bombers over the city of Valencia. Returning home from Spain as a married couple, David and Angelica pursue their careers, he as a painter whose work exposes a corrupt Mexican government with the searing truth of his murals and canvases; she as a crusading journalist equally committed to liberating the people of Mexico from government-censored news. Then, David gets sick and tired of Leon Trotsky meddling in the affairs of the Mexican government and decides to attack the house of Leon Trotsky in an attempt to drive him out of Mexico. There’s machinegun-fire, bombs, police sirens: David and Angelica flee prosecution in the mountains of Jalisco then escape into South America until the heat cools down, After Trotsky has been assassinated, they can return home. All of this action is back by original music composed by Jack Manno which stirs the experience of this unique radio noir production on a double album you’ll want to share with friends. The key roles are played by Sam A. Salas as David Alfaro Siqueiros, Karol de Rueda as Angelica Arenal, and Mark Sanchez as Lazaro Cardenas, President of Mexico.